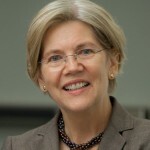 In her keynote speech at a Capitol Hill launch event for this AFR/Roosevelt Institute report, Senator Elizabeth Warren decried the failure of regulators and legislators to deal with the Too Big to Fail Problem. “We should not accept a financial system that allows the biggest banks to emerge from a crisis in record-setting shape while working Americans continue to struggle,” Senator Warren said. “And we should not accept a regulatory system that is so besieged by lobbyists for the big banks that it takes years to deliver rules and then the rules that are delivered are often watered-down and ineffective.